This weekend took us to a whirlwind trip of the beautiful Island nation of Sri Lanka, a place of astonishing beauty and serenity. For an Indian, Sri Lanka is a unique nation, so similar to our own when looked at superficially but so subtly different when you observe closely. We had been planning this trip for a long time. Names like Anuradhapura and Sigiriya were itched in my mind since childhood and it was time to live the dream. So one fine Thursday morning, we boarded a flight from Chennai and landed in Colombo in another 55 minutes. Since our destination was Kandy we decided to give a slip to Colombo and head to the mountains straight away. We had already booked a Hotel through Travelers Point and asked for pickup. When we arrived in Colombo, the cab driver Suresh (who was going to be our trustworthy and ever cheerful companion throughout the trip) was already waiting for us in the Paging area. As we had no foreign currency, we took some cash in Sri Lankan Rupees (LKR) from a nearby People’s Bank ATM and started for Kandy in a great Toyota Towner. The fare came to LKR 6600. The road to Kandy passed through scenic mountain roads (which were quite congested with traffic) and it started getting progressively cold as we ascended. Soon it started raining and we went into a rethink over not bringing any warm clothes to keep the bags light. Fortunately the cold remained pleasant and we were spared from freezing. Perched cozily amidst green mountains, Kandy is a beautiful city. The last bastion of the Sinhalese dominion before the British took over the entire island in 1815, the city has managed to preserve much of its culture and traditions and hence is known as the cultural capital of Sri Lanka. So you will find an interesting mix of the Kandyan style of living with Colonial buildings and roads. The streets are clean and there is whiff of freshness in the air. It is hard not to like this city instantly once you reach there. 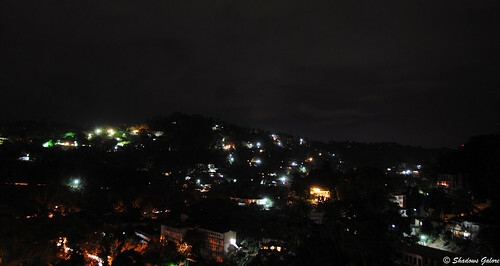 Our hotel, curiously named Blink Bonnie Inn, was located atop one of the hills directly overlooking the Kandy Lake. The view from our balcony was breathtaking; we could see almost all of the city, the tourist places and Pagodas and a Giant statue of Buddha atop a nearby mountain. A word about the Hotel Management, I have never met such friendly and hospitable people. The owner of the hotel, Stefen personally took interest in our trip, got us made a nice itinerary and even went all the way to the Railway Station to get our return Train tickets. Coming back to the trip, since it was already evening, we had limited choice of the places to see. 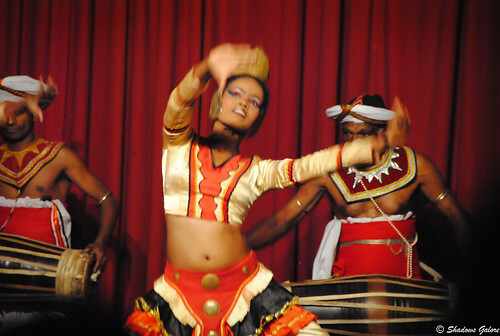 The first place we went to was the Kandyan Cultural Centre to see the famed Kandyan Dance. The show happens every day from 5:30 PM to 6:30 PM and the ticket costs LKR 500 per person. It was an amazing showcase of the local culture, the dancers were wonderful and the overall experience was very good. 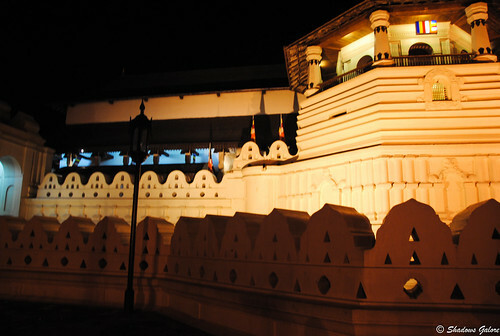 Our next stop was the most famous monument of Kandy, Sri Dalada Maligawa or The Temple of the Tooth Relic. 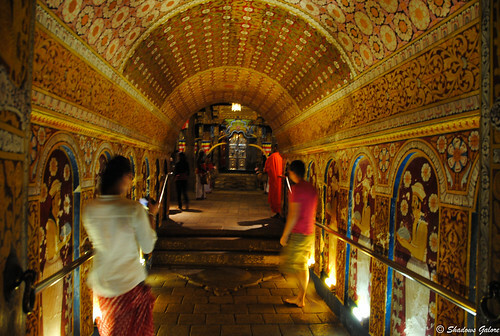 Located in the Royal Palace complex of Kandy, this World Heritage Site contains the tooth relic of Lord Buddha. As we took the tickets (LKR 1000 each) and went in, we were lost in the surreal beauty of the place. A milky white building with tiled roofs, the temple was a majestic sight to behold. The whole building was illuminated beautifully and stood majestically over tall ramparts. Inside, in a main hall, priests were doing the evening prayers as monks sat meditating. All around there were intricate wood carved terraces and balconied and walls adorned with beautiful paintings. More than the words, the photographs we have come back with will help you assess the beauty of the place. 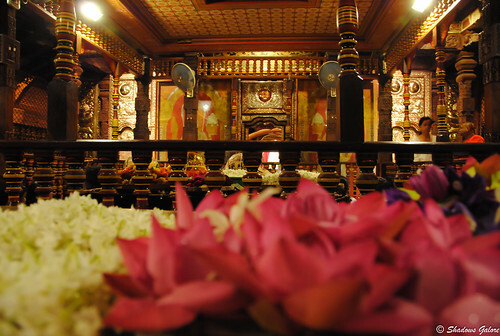 As we entered the main chamber, evening prayers were being offered and there were many devotees with offerings of flowers (lotus being the most prominent) and other things. If one word could explain the overall feel of the place, it would be ‘Peaceful’. After spending a lot of time in the Temple, we returned to the Hotel. From our balcony, we could see a beautiful sight – the stars in the sky and the city below us glittering like the mirror image. This trip was going to be a memorable one! Kandy, a set on Flickr. Excellent post! Kandy will be definitely on my itinerary when I visit Srilanka, thanks to you! My fav photo from this is surely the mystic archway, its looking really enticing! Deepak: Don’t let your hatred get the better of you. Wonderful post. Waiting for more. Lovely pics, and a very interesting read, loved the Lord Buddha (the one behind the veil through an arch) pic in the set. wow this is awesome. we see places of interest in sri lanka during cricket matches but with your post it seems we all are on this journey with u..
Lovely , nice place to visit .